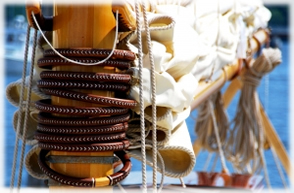 Yacht Insurance - Get Covered! Our aim has always been to retain your valued custom long term, so we always seek to provide a quality yacht insurance policy combined with a great UK-based customer service at fantastically competitive rates. Our long term business strategy honestly really is that simple! As a result fully comprehensive cover starts from as little as £111.56, this is based on live comparison data and for fuller details about how we calculate your rate see below. We're absolutely confident you simply won't find a better combination of value and quality yacht insurance anywhere, we pride ourselves on that. Furthermore we are a dedicated and experienced UK-based boat insurance specialist, so besides always dealing with named UK personnel you'll find we can deliver lots of other non-standard additional options for those with more bespoke needs should you need them. Quality policies underwritten by hand-picked insurers. Up to 30% no claims discount. £3 million Third Party Indemnity included. Optional protected no claims discount. Contents cover available upon request. No excess for first claims in home marina (conditions apply, see policy). Further reduce policy cost - variable excess. UK only staff... plus privacy guarantees. These rates are automatically updated daily based upon live policy data, so besides a great standard options list, you can be absolutely sure of just how competitive our rates are. Calculation of a yacht insurance premium normally involves an insurer determining a percentage rate (a higher rate represents more risk) which is then multiplied by your total vessel valuation. The primary rate is likely to be determined by your chosen cruising range, thereafter the rate (at an insurers discretion) can then be increased by factors such as racing cover, risky mooring locations, a recent claims history or other specialist stated requirements. The final rate is then usually multiplied by a stated vessel value after which any no claims or increased excess discount are discounted. Finally any applicable tax is added, this is 10% at time of writing in the UK. Is it a legal requirement to buy yacht insurance? No, yacht insurance is not a legal requirement in the UK, however you may need at least third-party cover to access private boatyards and marinas both at home and in Europe. If in doubt, always check locally in advance. If you do risk it, buying yacht insurance online is usually quick but equally a third party policy can at least give you peace of mind for as little as £51.32 per year. Can I buy yacht insurance online? In most instances you can buy yacht insurance immediately. Only under certain circumstances might you not be able to; higher than £500 000 vessel value, recent claims that need to be reviewed, vessel age above 25 years without a recent survey, non-standard cruising ranges, commercial vessels, vessels undergoing major refit/ repair. Remembering that more risk AND a higher vessel valuation equals a higher premium, firstly ensure your vessel valuation is accurate (check current market rates on a yachts for sale website). Secondly, certain factors are statistically known to increase the risk of claims: long distance cruising, racing, non-private/ unprotected moorings, older vessels. Ultimately get your valuation right, determine if you definitely need fully comprehensive insurance (we'd always recommend this for higher valued vessels however), then address those items you can to reduce risk. When buying yacht insurance online, no matter which company you insure with, you will be asked to provide the following information. Your yacht's make and model, build year, vessel length, legal owner(s), cruising range, mooring type/ location, no claims years / any recent claims and place of registration (UK or otherwise). Post-purchase evidence of no claims bonus will need submitting and older vessel owners (20-25 years+) may well need to supply recent boat survey evidence. Should I shop around for yacht insurance? Absolutely! We're confident our insurance matches anything available in our industry but we want you to be entirely confident you're getting the best deal for you. This advice is particularly relevant if you have a very high value vessel, want to insure multiple vessels or very specialist cruising/ activity requirements... in all instances it may also well be worth giving us a quick call on 01684 564 457 if you're unhappy with your immediate quote or our policy conditions. Remember we're an underwriter not a broker so we always have qualified staff immediately at hand to tailor your package to your specific circumstances. Our insurance policies do all usually supply additional options. For yachts these options are as follows; third party or fully comprehensive, protected no claims, increased legal cover, spars/ sails/ rigging/ contents cover, racing cover and an increased policy excess. Whether your journey is primarily just coastal UK or further afield, we'll leave you sailing smoothly with the ultimate peace of mind that you're in the right hands. Therefore why pay more and accept less? Get yourself a quote and get covered today.